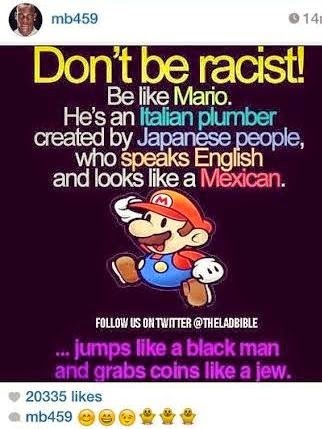 Just a few hours after Balotelli posted it on December 1, many people said they found it offensive and accused him of Racism and Antisemitism. Balotelli deleted the image after it caused a lot of controversy, denied the accusations of racism and then issued an apology on Facebook to people who found the pic offensive. The rule E3, cites as “aggravating factors” references to ethnic origin, colour, race, nationality, faith, gender, sexual orientation or disability. Former FA executive Simon Johnson Johnson, who is the current chief executive of the UK Jewish Leadership Council, called on the FA to punish the 24-year-old Balotelli, telling the Daily Telegraph. "We abhor all forms of racism, wherever it is found. We call upon the FA to investigate this offensive social media post and to take action if appropriate if we are to succeed in kicking racism out of football." Liverpool said they plan to speak to Balotelli, and said in a statement that they "are aware of the posting which has since been promptly deleted by the player."